The New Horizons spacecraft, which flew past Pluto in 2015, successfully completed a flyby of "Ultima Thule," an object in the Kuiper belt of bodies beyond Neptune on January 1, 2019. The name Ultima Thule, signifying a distant unknown place, is fitting but it is currently just a nickname pending formal naming. The official names of the body and of the features on its surface will eventually be allocated (this could take years) by the International Astronomical Union (IAU), which celebrates its centenary in 2019. The IAU's achievements during its first few decades include resolving contradictory sets of names given to features on the Moon and Mars by rival astronomers during the previous few centuries. The nomenclature working group's task would then have been largely over, had the space age not dawned – allowing space probes to send back images revealing spectacular landscape details on planets and their moons. Map of the Moon by Michael van Langren (1655). Building on some of the already entrenched lunar and martian names, the IAU imposed order by establishing themes for the names of features on each body. For example, large craters on Mars are named after deceased scientists and writers associated with Mars (there's an Asimov and a Da Vinci), and craters less than 60km across are named after towns and villages on Earth (there's a Bordeaux and a Cadiz). Apart from craters, most names are in two parts, with a "descriptor term" of Latin origin added to denote the type of feature that has been named. On Mars we find neighbouring valleys called Ares Vallis, Tiu Vallis and Simud Vallis, in which the descriptor term "Vallis" is Latin for valley. This is preceded by the word for "Mars" in a different language – in these examples Greek, Old English/Germanic and Sumerian respectively. Among other descriptor terms are Chasma (a deep, elongated depression), Mons (mountain), Planitia (a low lying plain) and Planum (a high plain or plateau). Descriptor terms are chosen to avoid implying that we know how any particular feature formed. For example, there are many scarps on Mercury that are currently interpreted as thrust faults (where one region of a planet's surface has been pushed over another). However, a neutral descriptor term – in this case Rupes (Latin for scarp) – is used so they would not have to be renamed if we were to realise that we'd been misinterpreting them. Similarly, none of the giant mountains on Mars that are almost certainly volcanoes has volcano as a formal part of its name. 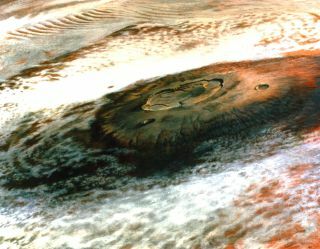 The largest volcano on Mars, Olympus Mons, coincides with an ephemeral bright spot that can sometimes be discerned through telescopes. Though this was initially dubbed Nix Olympica (meaning "the snows of Olympus") by the 19th-century observer, Giovanni Schiaparelli, space probes have since shown that the temporary brightness is not snow but clouds that sometimes gather around the summit. The IAU decided to keep the Olympus part of the name, qualified by the more appropriate descriptor Mons (mountain in Latin). Approved names on global topographic map of Mars. On the Moon, the IAU retained Mare (Latin for sea) as a descriptor term for dark spots, even though it is clear they have never been water-filled as was once thought. However, Michael van Langren's Mare Langrenianum, which he immodestly named after himself on his 1655 map, is now Mare Fecunditatis. Prior to the first detailed images of Jupiter's moons by Voyager-1 in 1979, the IAU planned to use names from the myths of peoples in Earth's equatorial zone for the moon Io. It would use mythical names from the European temperate zone for Europa, names from near-Eastern mythology for Ganymede and names from far northern cultures for Callisto. A map of part of Io, with names added. They stuck to the latter three, and so Europa has Annwn Regio (a region named after the Welsh "Otherworld"), and Ganymede and Callisto have craters named Anubis (Egyptian jackal-headed god) and Valhalla (Norse warriors' feast hall). However, because Io was revealed to be undergoing continual volcanic eruptions, the original naming theme was deemed inappropriate and was replaced by the names of fire, sun, thunder/lightning and volcano deities from across the world's cultures. For example, the names Ah Peku, Camaxtli, Emakong, Maui, Shamshu, Tawhaki, and Tien Mu (which occur on the map above) come from fire, thunder or Sun myths of the Mayans, the Aztecs, New Britain, Hawaii, Arabia, the Maoris, and China, respectively. The IAU has struggled to achieve cultural balance for some features. For example, the theme for Rupes on Mercury is "ships of discovery or scientific expeditions." By the nature of world history, there is a preponderance of Western ship names. For example, we find Adventure, Discovery, Endeavour, and Resolution – all four ships from Captain Cook's 18th-century voyages to the Southern Ocean and Pacific. Read more: Mysterious red spots on Mercury get names – but what are they? Personally, I am content that these were primarily journeys of scientific discovery rather than of conquest or colonisation. Cook's first voyage was undertaken to observe a rare transit of Venus, and his second voyage reached further south than ever before. Endeavour Rupes, the shadowed escarpment in the middle of a 400km wide view of Mercury. That said, it would be nice to redress the balance. In connection with a European planetary mapping project, one of my PhD students and I hope to get at least one of Mercury's as yet unnamed Rupes named after a canoe in which the Maoris arrived in New Zealand.